The world-first head-mounted perimeter “imo®” is equipped with a number of advanced functions in addition to standard automated perimetry (SAP) testing. “Head-mounted perimeter imo®” is portable. It does not require a dark room that conventional SAP needs, allowing the test to be performed in “every” room. Certainly, the test could be performed away from the clinic. 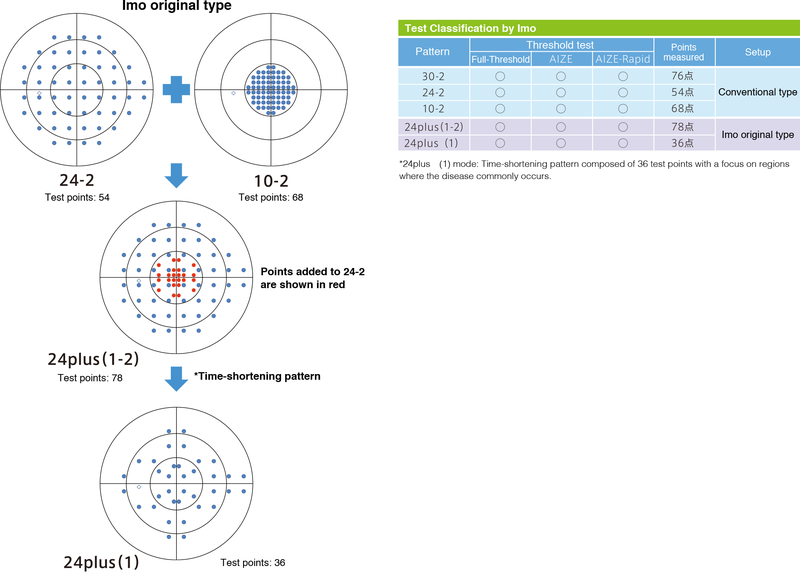 In addition to the “single eye test” of a conventional SAP, “Head-mounted perimeter Imo” allows random single eye test “with both eyes open”. Since this random test with both eyes open does not require covering one eye, a subject no longer feels discomfort when undergoing a test with a patch covering one eye, and stability for the tested eye is achieved from the binocular fixation. “Head-mounted perimeter imo®” is equipped with the world’s first original test program AIZE (Ambient Interactive ZEST) that we developed, which shortens the time of measurement while offering the equal test performance as conventional SAP. It takes 7 minutes and 24 seconds by conventional SAP to test one glaucomatous eye while it only takes 5 minutes and 40 seconds by AIZE. “Head-mounted perimeter imo®” is equipped with the test program AIZE-Rapid, which shortened the time of measurement even further than AIZE. Without changing the basic strategy of AIZE, the number of trials necessary to determine a threshold is reduced to shorten the test time by optimizing convergence conditions required for determination of thresholds while giving consideration to the balance between test accuracy and test speed and estimating false negatives, false positives and visual fixation monitoring based on a subject’s response during test. In addition to 30-2 and 24-2 test patterns commonly used for conventional SAP, “Head-mounted perimeter imo®” is equipped with the world-first 24plus test pattern which increases the density of central test points. 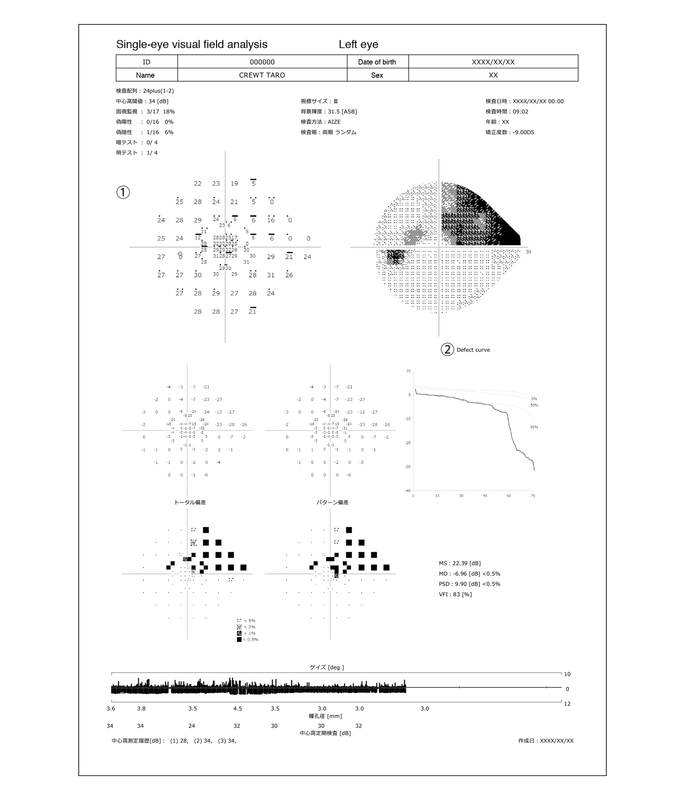 24plus is the original pattern with increased density of test points in the macular region by adding a part of 10-2 test points that is the central test pattern based on 24-2 test points. It is also equipped with 24plus (1) pattern with 36 points extracted from points where glaucoma is commonly found within the 24plus pattern. 24plus (1) allows to complete the test even faster (90 seconds for one normal eye) and is the optimum test pattern for screening. During test, “Head-mounted perimeter imo®” conducts real time monitoring of both pupils individually using a near-infrared camera for fixation monitoring. When fixation disparity occurs, its tracking function assures the test accuracy by following fixation and automatically correcting the target location (correction range ±5 degrees). This function helps to reduce burden on orthoptists (ORT) and ophthalmic medical assistants. “Head-mounted perimeter imo®” presents the same measurements on a result sheet as with conventional SAP. They include actual threshold, gray scale, total deviation, pattern deviation, change in gaze amount and change in pupil diameter. To confirm the reliability of test results at a glance, it automatically detects information which cannot be identified based only on gaze information (tracking successful/failed) and graphically presents the results of detection by each measurement point for actual threshold display. By using this data, its time-shift mode increases the reliability of test as it allows retesting only points where gaze was insufficient or restarting an interrupted test at the point where the test was interrupted. The smart-stand option supports subjects such as elderly who cannot bear the weight of the main unit (1.8 kg). The height can be easily adjusted electrically and the wheels makes it easy to move. Imo can be worn easily and can be quickly switched to head-mounted setup.